Offering A Wide Selection of New and Used RF Wattmeters and RF Loads. Since 1973 our RF engineering and products experience helps with your RF Power Measurement solutions. Huge inventory of Bird Model 43 Slugs! New and used wattmeters by Telewave, Daiwa, Coaxial Dynamics and Bird Electronic. Call us for assistance in your selection of RF Watt Meters and RF Loads at (781)430-0450 9-5 EST or use the menu on the left to select the items you require. If you don't see a menu on the left then click Martin RF Supply link at the start of this paragraph. Order directly with our easy to use shopping cart. Payment accepted by credit card, PayPal, or checks. All sales have a 100% satisfaction Guarantee! Next Day Shipping on most items! Domestic and International Sales are Welcome. The Coaxial Dynamics RF products are very high quality, reliable, and affordable and offer an excellent alternative to the Bird RF products. Martin RF Supply stocks a large inventory of new wattmeters and plug-in elements manufactured by Coaxial Dynamics. The meters have an in-line design and are similar in design to the Bird Electronic Thruline wattmeters. The Coaxial Dynamics and Bird plug-in elements (or "slugs") are interchangeable. There are several models of Coaxial Dynamics wattmeters available for average reading, peak reading, broadband (no plug-in elements required) and other applications. A Two year limited warranty on all Coaxial Dynamics products assures your complete satisfaction. Free shipping is offered on most new wattmeters! If you already have a collection of Bird slugs they will work just fine in the Coaxial Dynamics wattmeters. The Telewave Wattmeters are an in-line design wattmeter that require no plug-in elements and cover a wide frequency range and power range. If your RF power measurement requirements involve multiple frequency ranges and power ranges the Telewave wattmeters will be much less expensive in the long run as you save by not requiring multiple plug-in elements. There are Telewave wattmeter models available for both HF/VHF (2-200 MHz)and HF/VHF/UHF (20-1000 MHz). Martin RF Supply stocks new and used Telewave wattmeters. The Bird Electronic Model 4304A is similar in design to the Telewave design and uses a single permanent plug-in element for broadband power measurement. Free shipping is offered on most new wattmeters! Martin RF Supply offers a wide selection of used Bird Electronic wattmeters, plug-in elements, RF samplers, RF Loads, and other RF Products. Thruline is Birds name for the RF coaxial line design that they use to sample the RF in two directions. 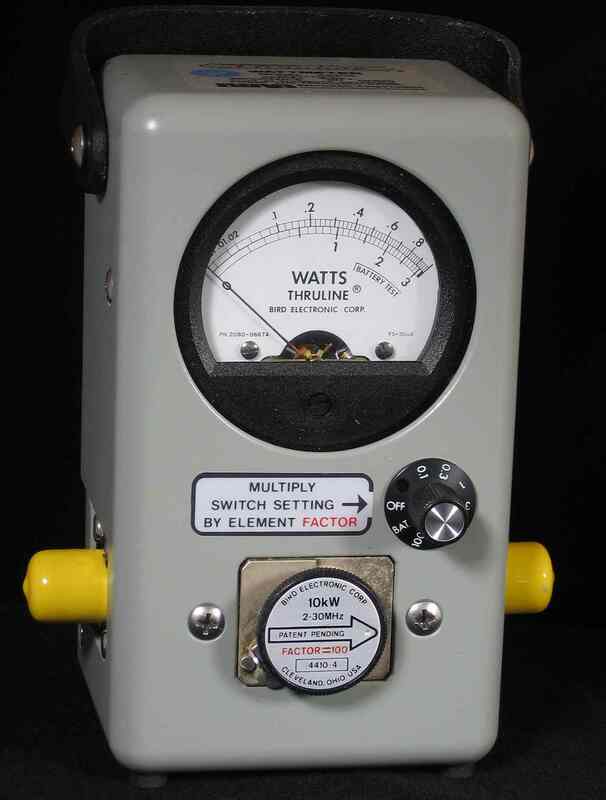 A Thruline (or in-line) wattmeter has two RF connections (input and an output) and is used in series with the RF Load or antenna. We have a large selection of Bird Thruline wattmeters. All used products are fully tested and you're guaranteed 100% satisfaction. We have the best inventory of plug-in elements (Bird Wattmeter Slugs) in the world and can provide next day shipping on all the popular element ranges. We also maintain a very large inventory of new plug-in elements by Coaxial Dynamics and they are 100% compatible with Bird Model 43 style wattmeters. 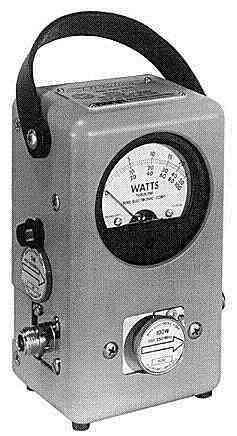 The Bird Model 43 and other similar in-line wattmeters require plug-in elements (or Bird slugs). A variety of Bird slugs are available to cover a wide range of frequencies and power levels. Martin RF Supply offers the best selection of new and used wattmeter elements in the world! Each used element is tested immediately before shipping and your satisfaction is guaranteed. New wattmeter elements by Coaxial Dynamics are factory calibrated, 100% compatible with Bird elements, and have a two year manufacturer's warranty. If you require a traceable calibration for your RF power measurements you should purchase a new element. The most economical and commonly used RF wattmeter is the Bird Electronic Model 43. Bird RF Wattmeters. I've been selling and using this model since 1967. The Bird Model 43 is the industry standard and is the benchmark for performance and reliability in routine RF power measurements. The Model 43 requires plug-in elements (often referred to as "slugs") for the frequency range and power range for which the meter is going to be used. There is a large selection of elements available that cover the frequency range from 0.45 MHz to 2.5 GHz in power ranges from less than one watt to 10,000 Watts. 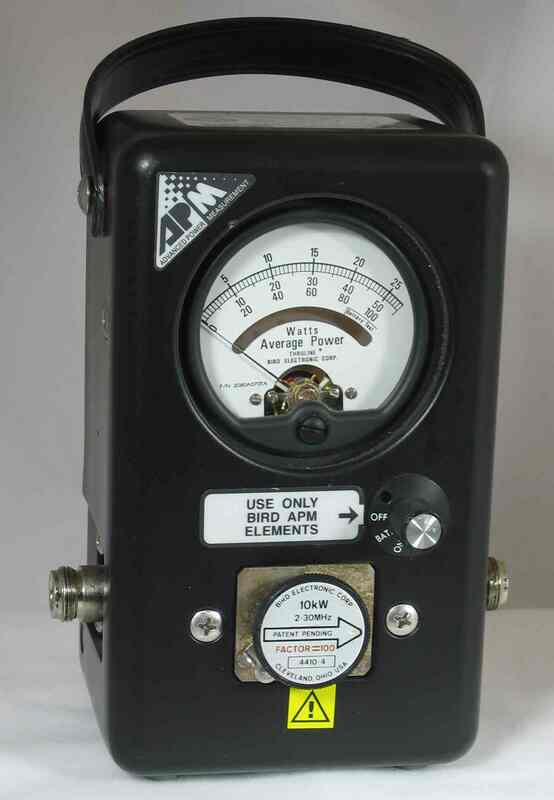 The Bird Model 43 is an in-line wattmeter that reads forward and reverse power. From these two measurements it's possible to easily calculate the SWR (Standing Wave Ratio) from the RF load (antenna, amplifier, filter, etc.). The connectors on the Model 43 can be Type N, UHF, TNC, BNC, etc., and are easily changeable with only a screwdriver required. Many users purchase multiple connectors and have them available for quick changes when needed. It's a good idea to have an RF Load available to terminate one end of the wattmeter if you are going to measure transmitter output power and do not want to use the antenna as a load. Martin RF Supply has a large selection of RF Loads for you to choose from. Coaxial Dynamics manufacturers high quality RF power measurement products similar to the Bird Electronic products and provides an excellent alternative to the Bird Wattmeters. The two manufacturer's plug-in elements are interchangeable. New Coaxial Dynamics products are offered with a 2 year limited warranty to assure your satisfaction. There are many RF Wattmeters that do no not require plug in elements. For example the Bird 4304A and all of the Telewave wattmeter products Telewave RF Wattmeters. These meters cover a wide frequency and power range without the need to purchase expensive elements. The meters have front panel switches that select the power range from 5 Watts full scale to 500 Watts full scale. Although, these broadband RF Wattmeters are more expensive initially, you will avoid a lot of expense by not requiring multiple plug-in elements or slugs in the future. Telewave, Inc. manufacturers a low frequency (2-200 MHz) and a high frequency (20 MHz to 1000 MHz) model of this type meter. You should note that the maximum power of 500 Watts on these style, as well as other RF wattmeters. is the RMS or average rated power. If you are measuring single side band (SSB) PEP (peak envelope power) the meter can be used at much greater than 500 Watts. As long as the average power is less than 500 Watts it will be displayed correctly on the wattmeter. When measuring RF power of SSB voice transmissions wattmeters will display the average power which is considerably less than the peak power. In other words, a 500 Watt maximum power scale will be adequate to measure SSB voice transmissions up to 2000 watts. For more details on this subject visit this link Power - What's It All About. To measure true peak power you will need a peak measuring wattmeter like the Bird Model 43P, 4314 and APM-16. See more on these meters below. The Bird Model 4410(A) uses special broadband elements to provide multiple power ranges using a single element. With the Model 4410(A) only a few elements are required to cover the frequency range of 0.5 to 1000 MHz and 1 Watt to 10,000 Watts. This meter provides the ultimate in RF power measurement versatility. This is one of our best selling models and is available in several packages. Bird Wattmeters For an example, the 4410(A) with one HF element (2-30 MHz) has seven full scale power measurement ranges of 1 Watt, 3 Watts, 10 Watts, 30 Watts, 100 Watts, 300 Watts and 1000 Watts. The Bird 4410(A) elements as listed separately and are not interchangeable with the Model 43 elements. If you plan to measure power at a lot of different frequencies and power levels the 4410(A) will save you money in the long run by drastically cutting the number of elements you will need to have on hand. Before I discovered the 4410(A) I was carrying around 15-20 elements to cover the many uses that I have for an RF wattmeter. Peak measuring RF wattmeters have additional circuitry that allows the meter to capture and display the maximum peak power. This is especially useful when measuring SSB voice transmission power. The Bird Model 4314 and 43P are examples of meters with this feature. These two meters use the same elements as the Bird Model 43. Bird Electronic and others manufacture offer user installable modules that can be installed in many Model 43 meters to add a peak reading feature. Look under Accessories in the online store menu to see these products. The Bird APM-16 employs active circuitry to deliver power reading accuracies of ± 5% for multiple-access technologies such as CDMA, TDMA, FDMA and other digitally-encoded communication systems. Special APM-16 series elements are required for the APM-16 wattmeter. As the name implies these wattmeters have a RF termination, usually 50 Ohms. They are available in a variety of shapes and sizes and can be air cooled or oil filled. They are typically good to about 100 Watts, however, there are some models that will handle as much as 1-2 KW, for example the Bird model 694. Adding a cooling fan to the heat radiator can extend the useful power range of the RF load. Martin RF Supply offers a good selection of terminating wattmeters and RF loads available at these two links Wattmeter/RF Load and RF Loads In-line wattmeters can be used as a terminating wattmeter by simply connecting a RF load to one of the RF connectors on the wattmeter. It is helpful to note that intermittent power ratings on most RF loads are much higher than the continuous power rating. For example a 200 Watt RF load can be used at substantially higher power levels if the transmissions are kept to a very low duty cycle. It's important to request duty cycle specifications from the manufacturer to be sure the duty cycle is safe for the RF load. You may download user manuals from the product manufacturer's website, see the links below, where some of this information may be located. Many of the RF wattmeters on our website have accuracies of around +/- 5% of the full scale range. 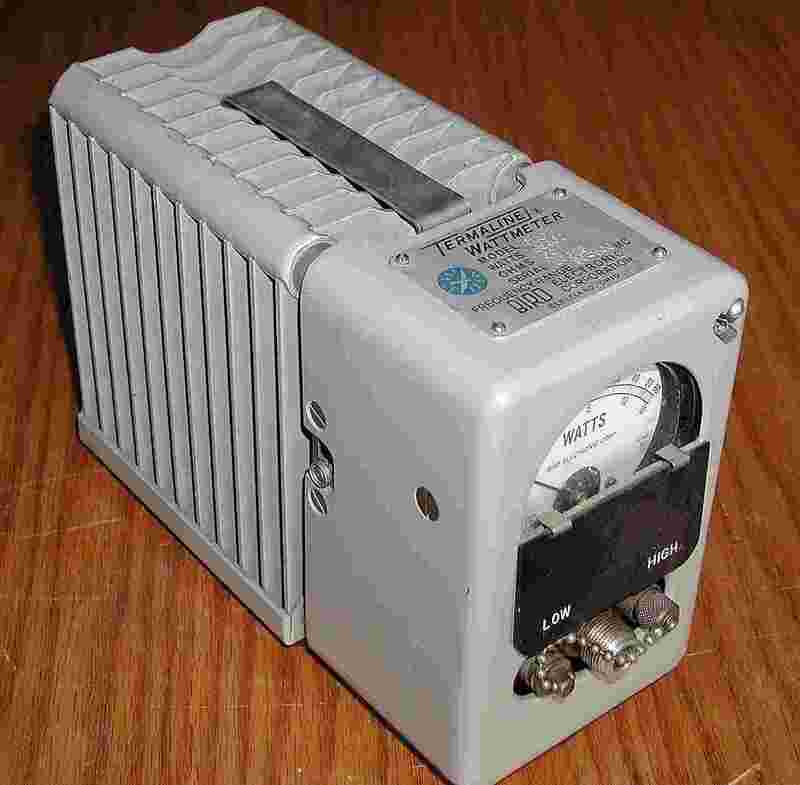 For example, a 100 Watt meter will have an accuracy of +/- 5 Watts on the 100 Watt scale. At the low end of the scale, say 10 Watts, this accuracy is not very useful. For low power measurements you should use a low power setting on the meter (if available) or a low power element. There are some exceptions, for example the Bird APM-16 has an accuracy of around +/- 5% of the reading instead of the full scale value. In this case the accuracy of a 10 Watt measurement on the 100 Watt scale is around 0.5 Watts. Refer to the manufacturer's links listed below to determine the correct and accurate specifications for any wattmeter. Calibration of broadband RF wattmeters requires some very specialized and expensive equipment. In almost all cases a NIST traceable calibration can only be performed by the manufacturer. Martin RF Supply checks each meter and element that we sell for accuracy using high quality calibrated wattmeters and test equipment, however, this is not a traceable calibration. If you require a NIST Traceable calibration on a used product we can have the product calibrated for you by the product manufacturer for an additional cost. This usually takes about 2-3 weeks and costs from $75-$400.